A Long Way To Go And A Short Time To Get There! We are just 3 days away from the time that we need to be boarding that plane for Kenya and preparations are well under way. The leaders are organizing the two conferences, the places we will stay are preparing for our arrival and the children are getting excited about our arrival. Heather has been preparing to lead two vacation Bible Schools and Andy and I have been preparing our lessons for the two leaders training conferences. Excitement is in the air as my phone has been ringing all day with leaders expressing their excitement for the conferences. As we are busily preparing for the trip we are still also praying for the Lord to provide. We have already received over half of what is needed. We are still lacking about $1,800 to meet all the upcoming expenses but we trust the Lord will provide! If the Lord is leading you to help us as we continue to take the Gospel out to the people of Africa please visit our ministry support page at http://www.newdaycm.org/ministrysupport.html I know that you will be blessed and God will take what you give bless it, multiply it and use it to touch many lives. I would like to invite all of my friends and family living close enough to travel to Miami Shores Baptist Church this coming Sunday for a very special day that they have planned. The Church will have many special activities. 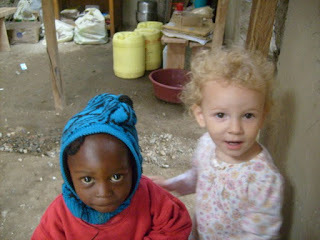 Among the activities will be a viewing of "Kenya through the eyes of Hannah". They will also be handing out our 40 Days of Prayer sheet to each person who is present. We are currently working out a way where we can able to communicate by video with those who attend this coming Sunday where you will have the chance to ask us any questions you may have before we head off once again to Kenya. Miami Shores is the church I was raised up in, where I came to the Lord, and where I first surrendered to God’s call to ministry as a young man. I am touched beyond words that the church I grew up in has committed this time in their services this coming Sunday and I pray that if you can attend that you will begin making plans today to do so. If you are not able to attend physically you can attend in spirit. Please pray for all that will gather and that through them and people like you the support that is still lacking will be provide soon so that we can purchase our tickets and continue forward unfettered in our missionary journey to Kenya. The Service will begin at 10:45 am. If you need driving directions or get turned around you can give me a call at 937-307-0694. I grew up there so I should be able to get you pointed in the right direction. I know that most of the people who receive this email will not be close enough to attend this Church on Sunday but you can still pray that Lord will bless them and use them to be a great blessing. If you feel lead to be a part of what this work through prayers and financial support please visit our ministry support page at http://www.newdaycm.org/ministrysupport.html Thank you for your prayers and support may God lead and guide you as you seek His will f or your life.